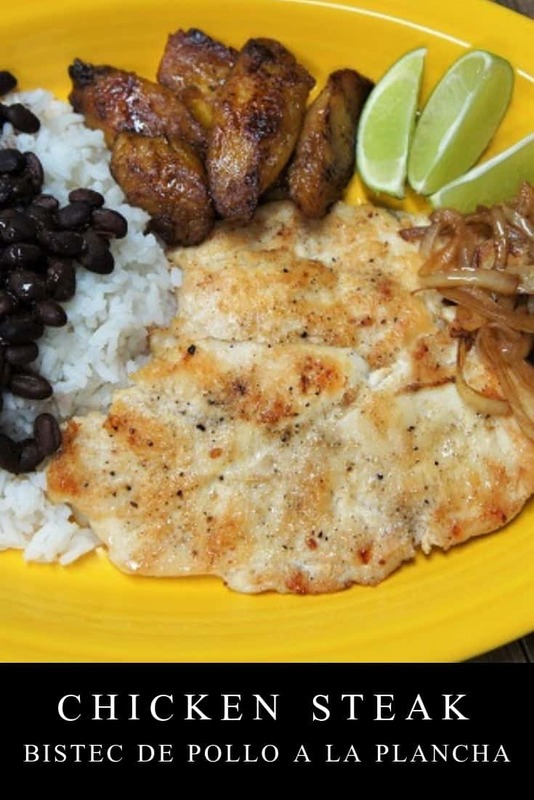 Chicken Steak, or bistec de pollo a la plancha, in Spanish, is popular dish that’s found in Cuban restaurants all over Miami. Chicken steak is a simple, quick dish that can easily be made at home. In this recipe, chicken breast is pounded thin, generously seasoned and fried until golden. Then it’s served with cooked onions and plenty of lime wedges. 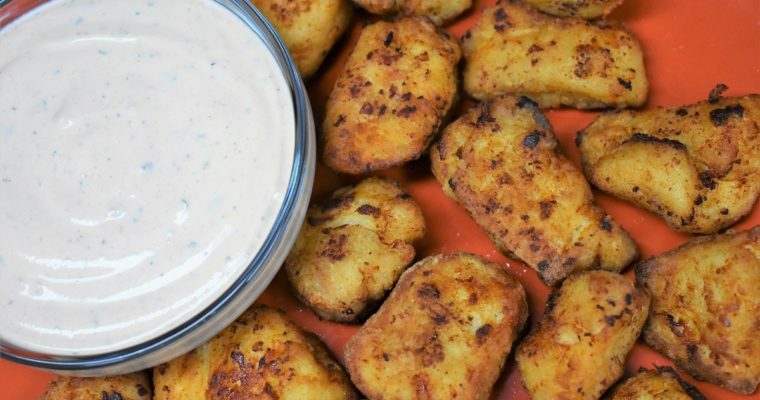 Great sides for this meal include rice, beans, plantains, mashed potatoes or salad. 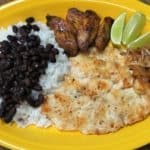 For more easy, quick Cuban style dinners, try this bistec de palomilla or this bistec a caballo recipe. Seriously good! Slice each chicken breast in half, lengthwise. Pound each piece, using a meat mallet, to about ¼ inch thick. Add the salt, garlic powder, cumin, and pepper to a small bowl, stir to mix well. Season the chicken on both sides with the seasoning mix. Preheat the oven to warm or to its lowest setting. Heat 2 tbsp. of the oil in a large skillet over medium-high heat. Add 2 or 3 pieces of chicken to the skillet (do not overcrowd the pan, fry in batches). Cook the chicken 3-4 minutes per side, until it’s a nice golden color and cooked through. Remove the skillet from the heat, remove the chicken from the skillet and place on a baking pan. Keep warm in the oven. Add 1 or 2 tablespoons of oil to the skillet and place it back over medium heat. Then repeat the steps until all of the chicken is cooked. 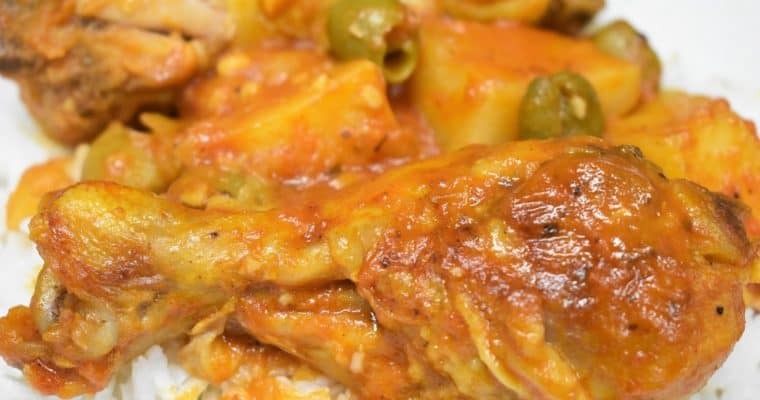 Keep the chicken warm in the oven until ready to serve. Cook’s Notes: The chicken may brown quicker on the second batch; lower the heat if necessary. Do not wash or wipe the skillet. Place it back over medium-low heat. Add the sliced onions and cook them for 3-5 minutes, stirring frequently. Serve the chicken steaks with the cooked onions and some lime wedges. Enjoy! 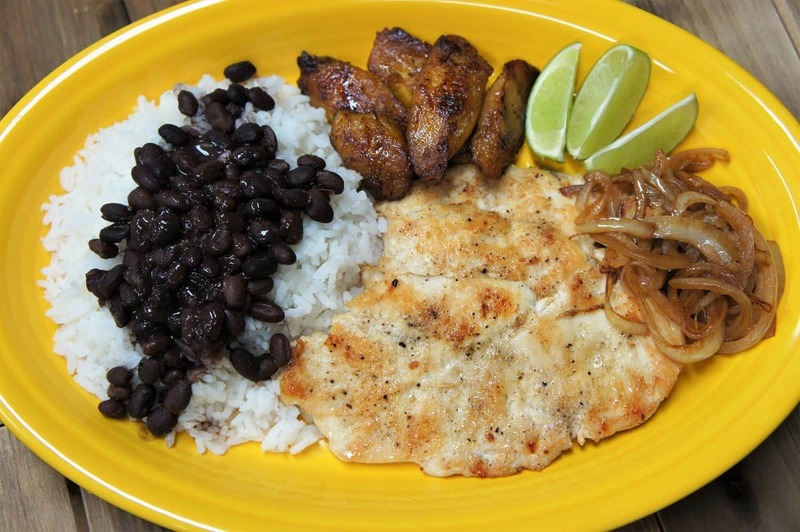 Chicken Steak – Bistec de Pollo a la Plancha, in Spanish, is popular dish that’s found in Cuban restaurants all over Miami. Heat 2 tbsp. of the oil in a large skillet over medium-high heat. Add 2 or 3 pieces of chicken to the skillet (do not overcrowd the pan, fry in batches). Cook the chicken 3-4 minutes per side, until it’s a nice golden color and cooked through. Remove the skillet from the heat, remove the chicken from the skillet and place on a baking pan. Keep warm in the oven. Add 1 or 2 tablespoons of oil to the skillet and place it back over medium heat. Then repeat the steps until all of the chicken is cooked. Serve the chicken steaks with the cooked onions and some lime wedges.